It's the study of humans and their cultures in the broadest sense. We study humanity, past and present, in all its biological and cultural aspects. Our students examine the diversity, origins, and evolution of human and primate culture and behavior, the development of human culture and the processes of culture change, the phenomenon of language, and the structure and meaning of human interaction. 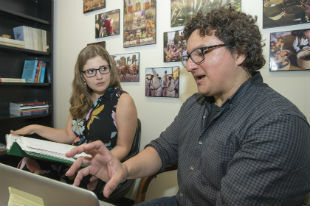 Senior Grace Vargas and associate professor Roberto Barrios are using a NSF grant to study the social after-effects of Hurricane Harvey in Texas. Check out video footage of our archaeology students discovering artifacts in historical sites. Check out announcements, publications and more from the department of Anthropology. Professor David Sutton recently appeared on the podcast "Anthropologist on the Street" to discuss the movie "Arrival" and its significance in the field of anthropology.